Kevin Spacey may be best known of late for his role as power-hungry politico Frank Underwood on the series "House of Cards" - but in real life, it's a sweet dog who rules his heart. In a recent interview with Ellen Degeneres, the famously private actor opened up about the day he met the puppy that would go on to become his beloved pet. I said, "Well of course I'd like to see a truck full of puppies." There were like 23 dogs and there was this one in the corner, and I looked at this one and she was looking at me and I said, "Who's that?" and she said, "We call her Cuddles." I said, "Why do you call her cuddles?" and she said, "You're about to find out." So I went over and I picked this dog up, and I did not get her to here (indicating his chest), she grabbed me around the throat, and hung down my entire body and licked my face like I had honey on it for about 15 minutes. 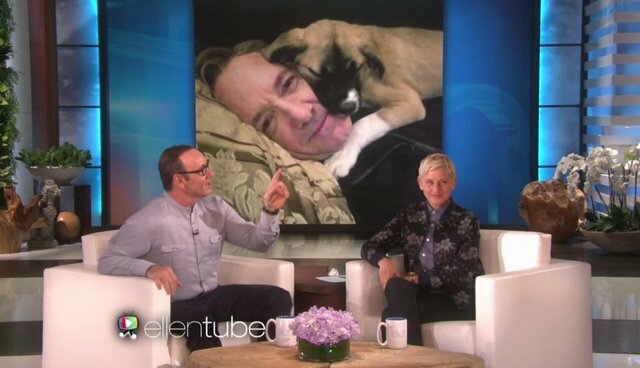 Spacey was so smitten by that charming little embrace that he had to bring the puppy home, announcing the adorable decision - and the dog's new name - to his followers on Twitter. It's been a match made in heaven.